Whether you're a stock, options or currency trader, you should be interested in flag chart patterns. Flags are known as "continuation patterns" because they signal a brief pause in price movement before continuing in their original direction. But their value is in allowing you to anticipate potential price targets for the underlying financial instrument or index that you're considering trading. 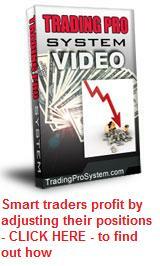 This one feature alone can allow you to achieve maximum profit potential from your trade - and if you're using the leverage that comes with options, that potential profit can be pretty awesome. The flag chart pattern is formed when price action forms a small counter-trend in the shape of a channel, that lasts for approximately 5-20 trading sessions. These sessions may be observed on both the daily or weekly charts and consequently, used for short or longer term option strategies. It is called a "flag pattern" because when you draw a trend line on the initial move and then add to it your parallel support and resistance lines above and below the counter-trend, the whole picture looks like a flag on a flagpole. The flag pattern can be observed on both upwards or downwards moves and therefore can be bullish or bearish signals. When you see a flag chart pattern form, it means that for now, the stock is undergoing a short period of price consolidation. But this break in momentum is only a pause before it continues it overall strong trend. It may appear to be a reversal at first but it is really just gathering strength for the next big move. It's important that we don't acknowledge a flag chart pattern until a breakout occurs which validates the fact that it was just that and not a reversal. The breakout must continue the price action in the same direction of the overall larger trend. 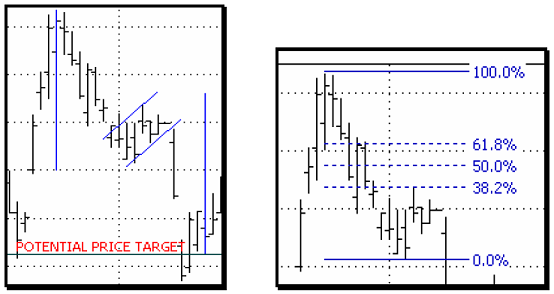 Flag chart patterns can be used very effectively in conjunction with Fibonacci retracements. The reason you apply Fibonacci retracement levels is, that you want to ensure that the temporary reversal that makes up the flag formation is not overdone. If the price action that forms the flag falls back more than 38.2 percent of the original move then it is more likely an indication that the overall trend is weakening. This in turn means that the flag pattern may not be so reliable for predicting the target price as already described. In the charts below, we can see some examples of how the flag pattern reverses only as far as the 38.2 percent level before the price action continues in the overall direction. If the flag chart pattern extended to say 50 percent retracement then we would not be so confident that the continuation target will be met. Note how the price target is set. You draw a line from the beginning of the prevailing trend to the first peak or trough (depending on whether it's an up trend or down trend) in the flag pattern . This line is called the "flagpole". The parallel lines form the 'flag'. Once the breakout occurs, you then copy the flagpole line onto the last extremity of the flag. This last line will give you the expected price target for the underlying. Another rule to remember is, that all breakouts from the flag pattern must be supported by trading volume. If volume is less than for the previous session or lower than the yearly average, then the breakout may not be valid. We should also expect to see lower volume during the period while the flag pattern is forming. This is because the trading range is reduced and the price volatility is falling out of the stock. But once the pattern is cleared and price continues in the direction of the prevailing trend, volume should increase. If you're trading long options positions in connection with flag chart patterns and want to achieve maximum benefit, you should ensure that your option expiration months reflect the time that it took for the original flagpole to form. You should allow the same time that it took for the flagpole to form for the price to reach the projected target, plus one month remaining till expiration. It's worth highlighting again, that the flag chart pattern works just as effectively on the weekly stock chart as it does on the daily. When trading the weekly patterns we should purchase longer dated option contracts such as LEAPS options, as the price target will take longer to achieve. With weekly chart patterns, you should look at how long the flag pole took to form and allow the same amount of time for the price target to be achieved. Paying attention to flag chart patterns in connection with the confirmation that Fibonacci retracements provide can lead to some of the most profitable option trades you may experience.